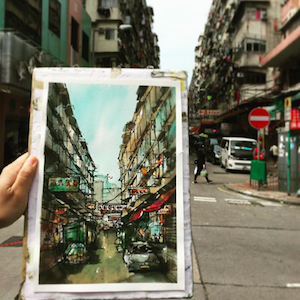 Unleash your inner-van Gogh in this workshop under the guidance of Hong Kong's brightest emerging watercolour artist Elaine Chiu. Learn the basic foundations of watercolour painting: from drafting a one-point perspective system to mixing the right amount of watercolour. Leave the class with a new found confidence in your artistic talents and explore the limitless opportunities of outdoor live sketches in the future. Thanks to our sponsor and art-advocate, Moleskine, participants will get to take home a watercolour notebook and vouchers to further hone their artistic skills. Workshop fee covers art materials and light refreshments. Suitable for ages 15 and above. Beginners are welcome! *P.S: We're doing a workshop for kids too!